It was blessed day for a mother of three when she received the news that she won 1 million pesos from the “Pera sa Kweba” text raffle. Marites Balagtas, who is the text raffle’s first millionaire, was awarded the facsimile of 1 million cheque by the Task Force PPUR at Ninoy Aquino Parks and Wildlife Center in Quezon City. 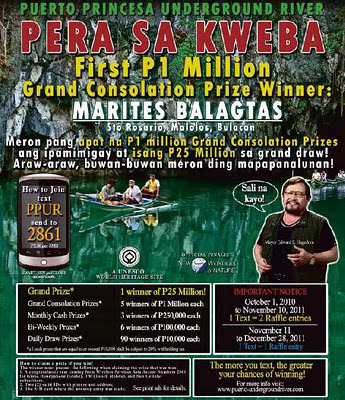 The “Pera sa Kweba” text raffle was initiated by the private sector to promote the Puerto Princesa Underground River (PPUR) in Palawan. The three telecom giants in the Philippines; namely Globe, Sun and Smart; gave 25 million pesos in prizes for the PPUR text raffle. PPUR was recently included in the provisional list of New7Wonders Foundation. The 1 million-peso prize came at the right time for Marites as her son was stricken with dengue. Her husband, who is a pedicab driver, is ill for several days. Their house was also flooded during the onslaught of Typhoon Pedring. Marites said that she will invest her 1 million-pesos prize for the education of her children and for the building of a small house. Department of Environment and Natural Resources (DENR) Secretary Ramon Paje said that the text raffle for the PPUR is extended until December 30, 2011. 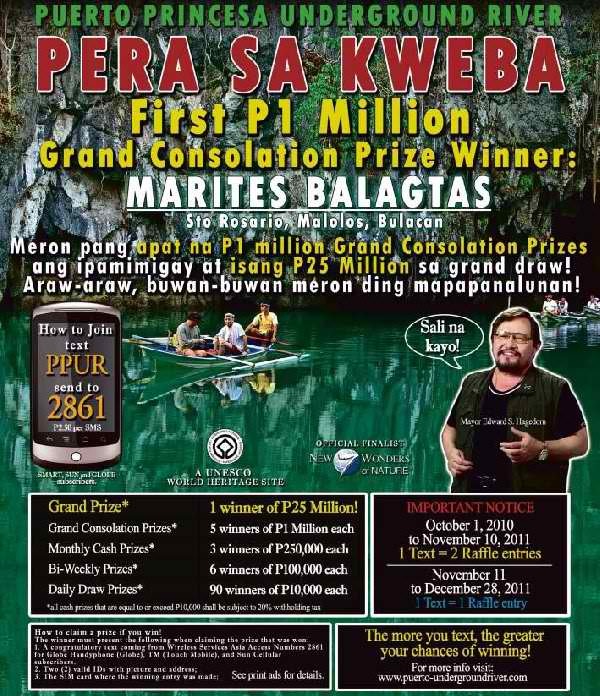 The grand prize is 25 million pesos that is why he urged the public to continue texting. Aside from the grand prize, there are still five 1 million pesos consolation prizes that are at stake for the PPUR text raffle. Anyone can join the PPUR text raffle by typing the word PPUR then send to 2861 for all network. Each text costs 2.50 pesos. Visit Before the Eastern Sunset and read about the mamon cake from Eng Ho.